This section is based on Questions from Series (number, figurative), similarities and differences, analogy, space visualization. Spatial orientation, problem solving, analysis, judgement. Decision making, visual memory, discrimination, observation. Direction sense test, Blood relations, arithmetical reasoning and figural classification. Arithmetic number series, non-verbal series, coding and decoding. Statement conclusion, syllogism in reasoning etc. The topics are Semantic Analogy, Symbolic/Number Analogy. Figural Analogy, Ranking test, Semantic Classification, Symbolic/Number Classification. Figural Classification, Input-Output questions, Problem Solving, Word Building, Seating arrangement, Numerical Operations, symbolic Operations. Questions on Dies, Clock, Calender. Trends, Space Orientation, Space Visualization, Venn Diagrams. Drawing inferences, folding & un-folding of Punched hole/pattern. Figural Pattern – folding and completion, Indexing, Address matching. Date & city matching, Classification of centre codes/roll numbers. Small & Capital letters/numbers coding, decoding and classification. Embedded Figures, Critical thinking. Emotional Intelligence, Social Intelligence etc. Through this section, a candidate's ability to understand and correct English etc. would be tested. Questions on Fill in the Blanks, Idioms & Phrases, Jumbled sentences (ordering), One word substitution. Synonyms, Antonyms, Spellings/Detecting Mis-spelt words, Common errors, sentence improvement, Passage, Cloze test are asked. This section is based on questions on Percentages. Ratio & Proportion. Square and cube roots. Surds and indices. Lcm and hcf, Averages, Age problems. Simple interest and Compound Interest, Profit and Loss, Discount, Partnership. Mixture and Alligation, Time and distance, Time & Work, Boat and Streams, Pipes and Cisterns. Numbers, Algebra, Geometry, Trigonometry, Heights and Distances. Divisions and Remainders, decimals ,fractions and relationships between numbers. Graphs of Linear Equations, Triangles (centres, congruence, similarity), In circles and circum-circle. Triangle, Quadrilaterals, Regular Polygons. Circle, Right Prism, Right Circular Cone. Right Circular Cylinder, Sphere, Hemispheres, Rectangular Parallelopiped. Regular Right Pyramid with triangular or square base, Trigonometric ratio. Degree and Radian Measures, Circle and its chords. tangents, angles subtended by chords of a circle. common tangents to two or more circles, Standard Identities. Complementary angles, Heights and Distances. Histogram, Frequency polygon, Bar diagram & Pie chart. 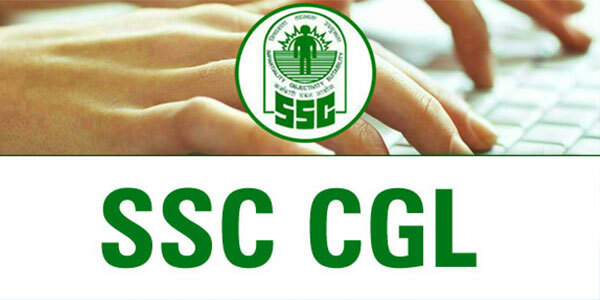 Tier 1 Syllabus of SSC CGL 2015 - General Awareness will have questions on current events, India and its neighbouring countries. Also questions from History. Geography, Economic Scene,Culture, General Policy & Scientific Research are asked. Scientific research includes physics, chemistry and Biology. Current affairs of Last 6 months are asked. Exam is objective type and will be conducted online. There are 4 papers, (Paper- 1) Quantitative Ability, (Paper-2) English Language and Comprehension, (Paper-3) Statistics and (Paper-4) General Studies (Finance and Economics). Paper-1 & 2 is compulsory for all posts and Paper-3 is only for the post of “Statistical Investigator Gr. II” & “Compiler” and Paper- 4 is only for the post of “Assistant Audit Officer”. Each paper carries 200 marks and exam duration is 2 hours for each paper. There will be negative marking for each wrong answer, negative marking of 0.50 marks in Paper-1, Paper-3 & Paper-4 and negative marking of 0.25 marks in Paper-2. Paper-1 (Quantitative Abilities) : It comprises with 100 questions and each and every question carrying 2 marks and the overall weightage for this paper is 200 Marks and there is 0.50 Marks of negative marking is applicable for each and ever wrong answer. Paper-2 (English & Comprehension) : In this paper questions are asked from English Language and It comprises with 100 questions and each and every question carrying 2 marks and the overall weightage for this paper is 200 Marks and there is 0.25 Marks of negative marking is applicable for each and ever wrong answer. Paper-3 : It comprises with Statistics question and for only those candidates who have applied for the post of Statistical Investigator Grade II & Compiler. And total time duration for this paper is 2 hrs. And Comprises with 100 questions and carries 2 marks for each and every question. there is 0.50 Marks of negative marking is applicable for each and ever wrong answer. Paper-4 : It is like Paper-3 which means those applicants who have applied for C&AG and Asst. Audit Officer post they all have to appear for Paper-4 and This paper is comprises with 2 Parts. NOTE-I : Questions in Paper-I will be of 10th standard level, Paper-II of 10+2 level and Paper-III of graduation level. NOTE- II: The Commission will have full discretion to fix separate minimum qualifying marks in each of the papers in Tier II and in the aggregate of all the papers separately for each category of candidates (viz. SC/ST/OBC /PH/Ex-S/General (UR) Only those candidates who qualify in all the papers as well as in the aggregate would be eligible to be considered for being called for Tier-III (Descriptive Examination), Data Entry Skill Test/Computer Proficiency Test/Document Verification. NOTE-III: Any representation to answer key of the examination will be scrutinized with the help of experts, wherever necessary, and evaluation in that case will be done with modified answer key. The decision of the Commission in this regard will be final and no further representation will be entertained.